Every year The CW brings together the heroes of its shared DC Comics universe -- the Arrowverse -- and gives them a common enemy to defeat in a multi-night crossover event. Last year, it was taking on Nazis from Earth-X. Before that, it was the alien Dominators in "Invasion!". This year, however, the crossover is looking less to invading forces to turn things upside down for heroes of The Flash, Arrow, and Supergirl and more to reality itself in this year's event, "Elseworlds". Announced back in September, "Elseworlds" may be the most eagerly-anticipated crossover yet for The CW's DC Comics shows and for good reason. There's a lot packed into the three-night event from the introduction of Batwoman (Ruby Rose) to the Arrowverse to some curious swaps that will see Arrow's Stephen Amell suit up as Central City's speedster while The Flash star Grant Gustin will find himself trying not to fail Star City with Green Arrow's bow. Does that sound like a lot? That's because it is, but it doesn't even scratch the surface of what we know is coming thanks to various promos, teases, photos, and even the official synopsis for the crossover. So, now that "Elseworlds" is just a week away from kicking off, we've put together everything we know about the crossover so far in one handy guide. After all Amell has described "Elseworlds" as "the crossover is f*cking bananas" during a recent Facebook Live. Read on for everything we know so far about "Elseworlds". When the poster for "Elseworlds" was released revealing Grant Gustin dressed as the Green Arrow and Stephen Amell dressed as the Flash, Arrowverse fans had some questions. Those questions got even deeper when first teasers from the event showed the two heroes having literally swapped lives -- much to their confusion and ours. Turns out the answer is pretty straightforward all things being considered. The heroes of The CW's DC multiverse will face off with John Deegan (Jeremy Davies), an Arkham scientist who almost certainly has ties to the DC villain Dr. Destiny, as well as The Monitor (LaMonica Garrett), who in the comics is a good guy, but who often has his own inscrutable agenda. It seems that Deegan has done something to rewrite reality -- creating a body swap for Flash and Green Arrow. Supergirl (Melissa Benoist) may not fare much better. A promo showed the Maid of Might locked up in STAR Labs' pipeline -- by none other than her sister, Alex (Chyler Leigh). You can check out complete synopsis for all three crossover episodes here. 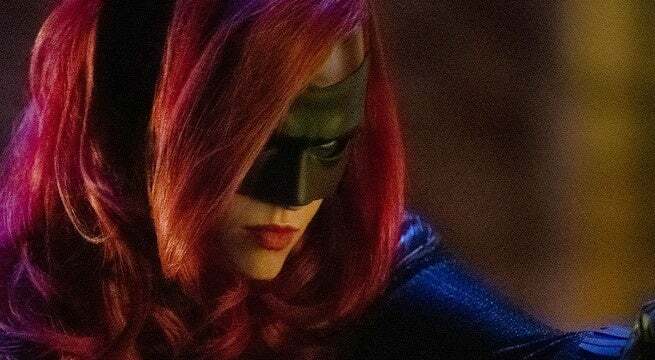 One of the more exciting known elements of the "Elseworlds" crossover is that Batwoman is making her Arrowverse debut. Played by Ruby Rose, Batwoman will make her first appearance during the second hour of the crossover when Oliver, Barry, and Kara all make their way to Gotham City to track down Arkham Asylum doctor John Deegan. While Batwoman's appearance in the crossover is exciting by itself, it may not be the last time fans see the character in the Arrowverse. The CW is currently developing a standalone series for the hero. Rose went on to speak about how much it means to her to be playing Batwoman, an openly gay superhero. Batwoman isn't the only DC character appearing in the crossover either. "Elseworlds" will be packed with appearances, a few of them Arrowverse debuts. Lois Lane (Elizabeth Tulloch,) Nora Fries (Cassandra Jean Amell,) and The Monitor (LaMonica Garrett) will all make their Arrowverse debuts during the crossover event. The crossover will also see some characters return -- such as Malcolm Merlyn (John Barrowman) and Joe Wilson (Liam Hall) -- as well as possibly Oliver and Barry taking a turn at yet another set of different characters -- the Trigger Twins. You can check out the list of characters confirmed for "Elseworlds" here. 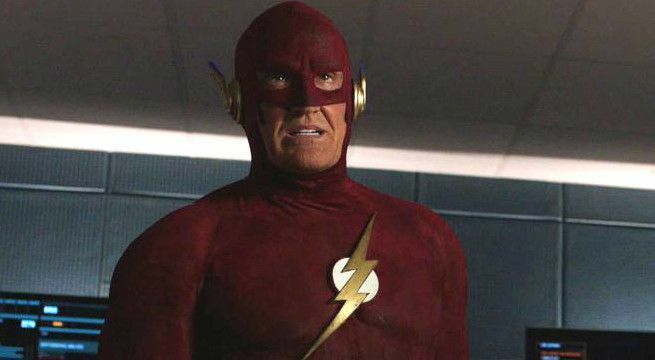 Back in the 1990s, John Wesley Shipp played Barry Allen/The Flash on CBS' short-lived The Flash series. For fans of the Arrowverse, they're used to seeing him as Barry's father, Henry Allen or as Earth-3's Flash, Jay Garrick. However, it looks like '90s Flash and the Arrowverse will collide in "Elseworlds". Photos from the crossover reveal that Shipp will appear in his iconic Flash suit and while there's been no confirmation that Shipp is playing his 1990s Barry Allen, we're hopeful that he's from the Earth where the 1990s The Flash series calls home. Another thing that has gotten fans excited about "Elseworlds" are glimpses of Tyler Hoechlin's Superman in the black supersuit. There is no telling exactly how the black-costumed Superman will operate in the crossover, but it certainly looks like he's a bad guy, either willed into existence by John Deegan or otherwise working for him. With the arrival of The Monitor in The CW's forthcoming "Elseworlds" crossover event, fans have been wondering how long until the other shoe drops and we get a hint that Crisis on Infinite Earths mega-villain The Anti-Monitor might show up...but comparably few fans have been asking about another character who plays a huge role in that story. Superboy-Prime, one of the multiverse's Clark Kents, was one of a handful of characters saved from being erased from history at the end of the first Crisis -- and he would return later to serve as the main antagonist in Infinite Crisis as well as a handful of other events, including "The Sinestro Corps War" and Countdown to Final Crisis. In the latter, Superboy Prime took on the identity of "Superman Prime," as well as donning the black-and-silver costume that the Man of Steel wore when he returned from the dead. One big difference between the "regeneration suit" worn by the main universe's Kal-El and the one worn by his demented doppelganger? Earth-Prime's Superman added a black cape to the outfit. That version of the costume -- featuring the cape and with "Superman" wearing his hair short -- was the visual inspiration for Zack Snyder's nightmare sequence in Man of Steel, and now will also be brought to life by Tyler Hoechlin's Superman in "Elseworlds." No, Tom Welling and Michael Rosenbaum aren't appearing in the crossover, but that doesn't mean its DCTV predecessor Smallville isn't going to be represented in some way in "Elseworlds". One thing we can bank on is that there will be some familiar settings, especially in the first night of the crossover. Barry, Oliver, and Kara all head to Earth-38's Smallville to pay Clark Kent and Lois Lane a visit and as we've seen in photos, that visit will include the same Kent farm used in the Smallville series. And, according to Stephen Amell, that may not be the only nod to the beloved Superman series. “It is not a Smallville reunion, although I think it becomes pretty clear in the promos for the crossover that there are Smallville elements, at least, in terms of location." Amell explained. "And if you’re a fan of Smallville, and I have no idea if they’re going to keep this in the final cut, but there’s a treat in there that, I swear. Full disclosure, I’ve never seen an episode of Smallville before, sorry! I wasn’t that into comic book TV shows when I grew up. I’ve since seen a couple, for very obvious reasons. But as someone who wasn’t a diehard fan of Smallville, this moment made me jump out of my seat. If you’re a fan of Smallville, you may want to put down rubber sheets or something like that. Because, quite frankly, you might piss you pants." In a break from tradition, the Arrowverse crossover will not include one of the shows -- Legends of Tomorrow. “[Last year's "Crisis on Earth-X" was] very hard on the crew, it’s very hard on the cast, and we wanted this year to just be a little easier." Guggenheim explained to Entertainment Weekly. "That’s why we focused on crossing over mainly the leads of the shows and not including a fourth hour. The hard thing about crossing over with Legends is, because that’s an ensemble show, you’re crossing over with the entire cast." That said, he also revealed that while the crossover won't have its own hour of the crossover and while most of the characters won't appear, fans should keep their eyes peeled as "there is a Legends cameo in hour 3" of the event. "Elseworlds" will also have a slight shift in schedule for the three nights of the event, but don't worry: it won't require you to update your DVR recordings. 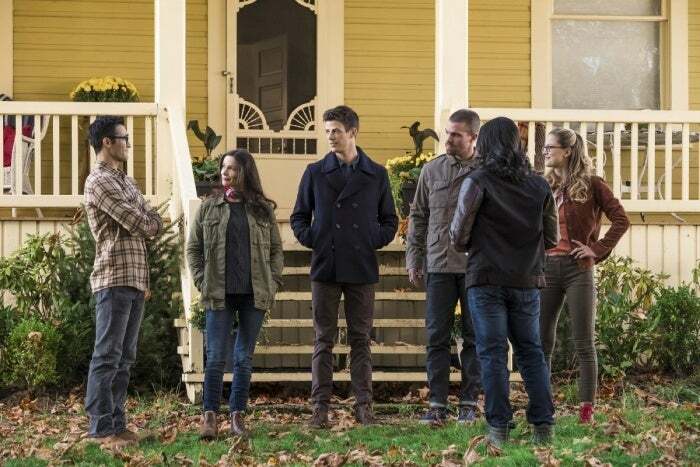 The "Elseworlds" crossover will begin on Sunday, December 9th with The Flash -- the series usually airs on Tuesdays -- at 8/7c. It will be followed by Arrow in its regular timeslot on Monday, December 10th at 8/7c, and will conclude with Supergirl -- which usually airs on Sundays -- on Tuesday, December 11th at 8/7c. Are you ready for "Elseworlds"? Let us know in the comments below!